"Don't vote for UKIP, you'll let Labour in". Please forgive me if I am somewhat unsympathetic to the current Tory plight. If UKIP do surge and get as many votes as polls are suggesting then yes, it is very likely that eventually it will cost the Conservatives a number of seats that they would otherwise have won and yes the vote on the right could be split in a number of places allowing a more centrist or left-wing candidate to come through the middle. ..consider the recent Eastleigh by-election. Two Right-of-Centre candidates stood on virtually identical platforms. Both wanted an In/Out referendum, and both would have voted to leave. Between them, they secured 53 per cent of the vote, and lost, handing the seat to a Euro-integrationist Lib Dem with 32 per cent. That is indeed exactly what happened in Eastleigh. It is also exactly what those of us who campaigned for a Yes vote on AV repeatedly tried to explain is one of the major weaknesses of First Past the Post which is eliminated with a preferential system. But of course the Conservative Party were dead against changing from our current system. So they have to take the consequences under FPTP. If this means they end up losing lots of seats because of a surge to UKIP then so be it. They've made their bed. They can now lie in it. Sounds to me like Nigel Farage is just being honest. All parties will have a few candidates they'd "rather not have"
Yesterday the publicist Max Clifford was charged with a number of indecent assaults against girls and young women dating back to the 1960s. Normally when people are charged with serious crimes we may hear the charges have been made and the identity of who has been charged. That is then usually that until the court case and the verdict when we then find out whether the due process has found them guilty or not guilty. But in this case straight after the charges Max Clifford held an impromptu press-conference outside his house which was well attended and widely reported in which he strongly protested his innocence. Why on Earth is the media giving this man a platform like this? He has been charged and a court will decide his innocence or guilt. The fact that he is claiming to be innocent at the moment is barely even news. Most people accused of crimes of this severity claim they are innocent. The media hardly ever reports this fact so un-newsworthy is it. I am reminded here of what happened with former Sun editor Rebekah Brooks when she was charged with conspiracy to pervert the course of justice last year. She too held an impromptu press conference protesting her innocence which was also widely covered. Just because these people are famous should not mean their cries of "I'm innocent" should be given more weight than for other mere mortals. They should keep their heads down and allow the judicial process to take its course. And the media should not indulge them. I have no idea whether Clifford or Brooks are innocent or guilty. But one thing is for sure. Them claiming that they are innocent is pretty much meaningless. After all they would say that wouldn't they? One of the proposals in the coalition agreement in 2010 was to alter the boundaries of constituencies to ensure more equal numbers of voters in each seat. As it happens, this policy fell by the wayside in the aftermath of the Tories backing away from reforming the House of Lords. But for a time it looked like the equalisation of constituencies was going to happen. Labour were dead against this change. They came up with various arguments against it but the term I saw used time and time again was "Gerrymandering". This is a term coined in the 19th century to describe a situation where boundaries are manipulated in order to favour one political party. I bridle every time I see this word used with respect to the boundary changes. The boundaries in the UK have become so distorted over decades that there are some constituencies with only just over 50,000 voters and some with double that number. The idea that the current boundaries are somehow "fair" is nonsense. The equalisation was intended to ensure that constituencies had roughly the same number of voters (within a tolerance of about 5% around the average). It was likely that the Conservative Party would have benefitted from the changes. But the current situation is manifestly unfair. How can it be the case that in one area a voter has about twice as much influence in terms of how much their vote counts towards electing an MP? So to use the term gerrymandering in the context of trying to redress a huge historical imbalance is utterly perverse and wrong in my view. Don't get me wrong. I think there are much better ways of reforming our electoral settlement than tinkering with boundaries under first past the post. But after the debacle of the AV referendum we are stuck with our current system for now. So in that context ensuring the boundaries are more evenly distributed is actually fair. It only didn't happen because of shortsighted Tory MPs assuming they could break one part of the coalition agreement and for there not to be consequences. Because gerrymandering relies on the wasted vote effect, the use of a different voting system with fewer wasted votes can help reduce gerrymandering. In particular, the use of multimember districts alongside voting systems establishing proportional representation such as Single Transferable Voting can reduce wasted votes and gerrymandering. Semi-proportional voting systems such as single non-transferable vote or cumulative voting are relatively simple and similar to first past the post and can also reduce the proportion of wasted votes and thus potential gerrymandering. Rather than throwing around inaccurate terms implying political corruption they should redouble their efforts to get behind proper electoral reform. Then any future attempts to gerrymander, perceived or real would have much less effect anyway. But lots of the dinosaurs in Labour don't want that. Could it be because the current system benefits them so disproportionately? They should be careful about that. They don't want to be accused of gerrymandering now do they? Did you hear the good news? Crime is massively down in the last 10 years! Hurrah! Violent crime is down by a quarter, a more rapid fall than the average across Europe. Rejoice! The number of people treated in hospitals after violent incidents is down 14%. Booyah! Did you not see all the front pages of the newspapers today leading with this story? You didn't? Oh hang on a minute yes, they didn't splash it all over their front pages my mistake. I learned about it on the BBC News at 10 last night. The story was at about 10:20, probably about seventh or so in the running order. But because it is a "good news story" the media considers it to be less important hence no front-page splashes and by the evening news relegated to the second half of the programme. This is why we have the bizarre situation where crime has been falling for a very long time and simultaneously fear of crime is going up. Bad news sells so the perception is that horrible crimes are happening more and more as these are reported ad nauseum while the real picture that things are getting better seldom gets a look in. *I tweeted about this and a number of BBC people pointed out that Radio 4 Today and BBC Breakfast covered the story as a lead item. That is fair enough and I didn't see them but my point still remains that if the story had been "bad news" it would I am sure have led the 10 O'Clock news (or been very near the top) rather than so far down the running order. The BBC are better than most but are not immune from this bias towards negative stories. Episode 55 of the House of Comments podcast "Paris Blues" was recorded on Sunday and is out today. This week I was joined by Labour activist and councillor Grace Fletcher-Hackwood to discuss the case of Paris Brown the 17 year old who was forced to stand down from her position as youth advisor to a PCC, Labour's position on cuts and public finances and looking forward to the local elections in a couple of weeks time we consider whether there is likely to be a UKIP surge. Q on my blog "If Clegg had been entryist tasked w ensuring LDs faded into oblivion what wd he have done differently?" Good line: "PCs are a victims of non-planned non-obsolescence"
How many of your Twitter followers are dead? This question occurred to me recently. I started to do some calculations and what I found is a bit creepy. I have a little over 7,300 followers on Twitter. I have been active on the site since 2009 so that's roughly 4 years. If we assume that there has been a fairly steady rise then in each of the years I have been active I have had an average of around 3,650 followers in each of those years. I expect some of the accounts of the deceased are closed down but as we know there are problems with this and it requires surviving relatives to be quite on the digital ball which often they are not. They have after all more important things to worry about! So if I assume that half of those accounts will have been closed down (which I think is generous) that still leaves 45 of my followers that are likely to have passed away. And of course those with more followers than me and/or those who have been on Twitter for longer will likely have even more followers who are in reality no longer with us. *I am of course making a few assumptions here regarding the maths and also assuming all my followers are from the UK and distributed evenly across the age ranges. If anything a more detailed analysis would probably find the figure of 42 is something of an underestimate. Oh and I am also assuming that all of my followers were real people in the first place rather than automated accounts or spambots. These things probably balance each other out though. "We need a fresh start and my party is the only way. Despite the evidence." So essentially says Jon Trickett in the Guardian today. His thesis is that we are close to another major political turning point in 2015 rather like the one that started with the election of Margaret Thatcher in 1979. He also thinks that Labour (the party he has been a member of for 30+ years) is the only one that can bring about this change. ...when a country arrives at a turning point, as we clearly had, the direction that it takes is not pre-determined. Thatcher had understood all of this too. As we now know, it was she who ended the interregnum into which the country had fallen. She broke with the Attlee consensus and created a new settlement that has endured (albeit modified by New Labour) ever since. Thus it was possible for Tony Blair to say – in his comments immediately in the aftermath of Thatcher's death – that: "I always thought my job was to build on some of the things she had done rather than reverse them." Both the Tories and the Liberal Democrats are hopelessly compromised by their period in office. The Tory modernisation project has been jettisoned partly due to the threat from Ukip, and the Lib Dems have irrevocably embraced divisive neoliberal economic and social reform (such as the NHS reforms). Therefore, if there is going to be a government that will usher in a fresh start for Britain it will be the Labour party. I don't necessarily disagree with Jon's broad thesis. I think something does need to change quite radically in our body politic. I wouldn't be at at all surprised if in decades to come the next few years is seen as another historical pivot point. But it takes a certain kind of willful blindness to look at the evidence of how all three main parties have bought into the post 1979 Thatcherite consensus including essentially Labour (with a bit of tinkering around the edges) for 13 of those years with massive majorities when they could have forced a change in direction and decide the only party that can effect change is Labour. If they couldn't do it between 1997 and 2010 why is he so certain they can now? If we are to see a new political consensus it is likely to require the backing of people across the political spectrum and also from outside. This sort of blinkered tribal thinking will not help us get there. Episode 54 of the House of Comments podcast "We need to talk about Margaret" was recorded yesterday and is out today. This week I was joined by libertarian blogger Mark Wallace of Crash Bang Wallace to discuss the impact and legacy of Margaret Thatcher in the wake of her death last week. We cover a fair bit of ground including her rise to power, her early days, the miners' strike, the Falklands war, the Poll Tax, the culture of selfishness some say she fostered and finally her fall from power, her legacy and the shadow she casts across contemporary politics. We also tackle the question of just what balance she struck between pragmatism and ideology. There were a couple of sound problems during the recording so please forgive the odd blip! My friend Isabel Hardman of The Spectator Coffee House blog wrote an interesting piece yesterday entitled "Seven awkward questions for the Tories" which was itself prompted by the seven questions Tony Blair had recently posed for Labour. I thought I'd have a go at posing seven questions for my own party as we move into the final two years of this parliament. 1) How can the party fight the next election running against numerous Tory policies that they don't like but have allowed through? There is a difficult and delicate line to be trodden between making it clear what distinctive Lib Dem policies look like and distancing ourselves from those measures we would not have implemented ourselves whilst not looking like we are trying to run away from our record in office. Politics is so often filtered through a binary prism. The idea that a party may have compromised on measures does not sit easily within this system. We need to find a way to make this argument without constantly fighting a rearguard action against accusations of "betrayal" which Labour (and indeed the Conservatives) will throw at us. This will be particularly true if leader debates go ahead in advance of the election. If Clegg is still the leader in 2015 he will not have the luxury he had in 2010 of being able to attack the Conservative's record as he will be attacking his own! It will take a great deal of political skill to navigate this and not come out looking hypocritical or ridiculous. 2) How can the party restore its much vaunted internal democracy? One of the reasons joining the Lib Dems was attractive to me several years back was that the members made the policy. 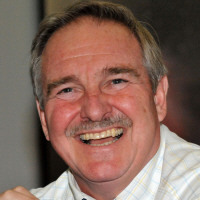 Recent events such as the parliamentary vote on secret courts which led to a number of significant figures quitting the party have shown the limits of this. I actually submitted one of the emergency motions on this to the recent conference (mine was not picked but the other one by Jo Shaw was) and the point was repeatedly made to me that it is against our constitution to "mandate our parliamentarians". This point was also made from the floor during the debate on Jo's motion. But if our MPs can essentially do what they like in direct defiance of the will of the party membership then this shows that we are not so very different from the other two main parties with a de facto top-down structure. This is one of the biggest crises the party faces. We all thought we as voting members determined the policy programme. The party needs to find a much better way of reconciling a restive membership with being in government. 3) What do the Lib Dems stand for? Alex Wilcock set a challenge last month for Lib Dem bloggers to set out what in their opinion the Lib Dems stand for. I did not personally participate in this and I think this fact is rather telling in that I am struggling to answer the question at the moment. Before 2010 I would have had no problem talking about civil liberties, social justice and all of the other good stuff referred to in the preamble to our constitution. But after all the compromises of government it is getting harder and harder to point to a distinctive theme for the party. The next manifesto needs to make this clear and give us all something to unify behind and fight for. 4) How can the party make sure it is still heard in the run up to the next General Election? The last three years have been anomalous in terms of how much coverage the party has had. We have 5 cabinet ministers including the Deputy Prime Minister and over 20 junior ministers. What we decide really matters in a way it hasn't for 65 years or more. But as May 2015 approaches I expect we will start to see a squeeze on this. That binary prism effect will kick in once more as the media focuses on "who do you want to be the next Prime Minister". The increasingly presidential style of our media coverage and the fact that no major publication is likely to back the party directly means we will once again have to fight for every column inch and soundbite. 5) How does the party deal with its Northern problem? I've nicked this one directly from Isabel but it is an important question for the Lib Dems as well. We have numerous seats in the North many of which have relied on "borrowing" votes from Labour leaning voters. How many of them will be willing to still vote for a Lib Dem after 5 years of being part of a Conservative led government? Incumbency can be a powerful tool but the anger of the electorate can be stronger still. 6) What is the party's position on electoral reform? At previous elections this has been a no-brainer. We want STV with multi-member constituencies for a more proportional parliament. The problem is AV was overwhelmingly rejected by the electorate and whilst I will to my dying day keep shouting that "AV is not PR" the plain fact is electoral reform for Westminster is off the table for the next decade or two at least. There are some like me who say we should focus more on reform for local council elections. There are very strong arguments for this such as stopping the all party fiefdoms that too many of us live under locally but we need to be careful not to appear like pig-headed ideologues ignoring the will of the people. At least that's how our opponents will paint us if we're not careful. 7) How do you solve a problem like Nick? I like Nick Clegg. He's a nice guy and a much better politician than many of his opponents in the media claim. But there is a simple fact that he is the politician most closely associated with the compromises and difficult decisions of government. I know there are a fair few former Lib Dem voters who will never vote for the party again whilst he is still leader. There are also plenty within the ranks who feel bruised and battered and as 2015 moves ever closer will start to wonder if a Cable or a Farron might help heal some of the wounds. There are reports that at football matches at the weekend there is to be a minutes silence to remember Margaret Thatcher. This strikes me as a strange and somewhat foolhardy move. Strange because I do not recall any such thing being done for Wilson or Callaghan or Heath or Macmillan (all former PMs who have died within my living memory). Foolhardy because Thatcher was such a polarising figure that although there will doubtless be a fair few in each crowd who liked her and are happy to pay their respects there will also be a significant number who do not wish to. Some of those may just not attend the match. But it is likely that a good number will attend and it will only take a few of them to make noise during the silence for it to be ruined. If that does happen then of course the headlines will be all about how "DISRESPECTFUL FANS DISRUPT THATCHER SILENCE" even though it will probably only be a small number of people. It's all so unnecessary. Just don't have a silence for such a controversial figure in a place where there are tens of thousands of people. With the news yesterday of the death of Margaret Thatcher there has been much comment in the media and on social media regarding her life, her time in office and her legacy. Some of it measured, much of it polarised in one camp or another. My view of her legacy is mixed. I grew up in a family and extended family who hated her, her politics and what she stood for. So that was my background. But as I have learned more over the years and read various biographies of the time (not least her own) I have come to a more nuanced view. I still think she did a fair bit of harm but there was some good too. In the weeks, months and years to come there will be plenty of time to look critically at her legacy but in the febrile atmosphere of the next few days following her death and in advance of the funeral I would rather stay away from that. Privatisation of the telecoms industry. At the time there was a feeling on the left that privatising state owned services like British Telecom was "selling off the family silver". But the fact that it could take weeks or months to get a phone line installed when it was owned and run by the General Post Office and the woeful lack of any sort of competition meant that the industry was stagnating. Allowing the market in took what appeared to be a natural monopoly and opened it up to market forces which allowed innovation and competition to hugely improve the available services. It's not perfect of course but I am certain it is much much better than what would have happened had it have been state owned. It is very telling that no serious politician these days would ever dream of suggesting that this industry be taken back into state ownership. Unlike some of the other privatisations the success of this one is accepted across the political spectrum. On a personal level this policy directly affected me. For the first 6 years of my career after graduating I worked for telecoms companies writing and testing software for exchanges and later mobile systems. I suspect my career would have taken a very different path had there not been such an open telecoms market in 1995. Some of the reforms of Trade Unions. The fact that votes to go out on strike could be executed via a show of hands rather than a secret ballot was an absurd legacy of a bygone era and left the system open to potential intimidation. Also the fact that members who did not back the majority decision could be disciplined was bizarre and needed to be reformed. The closed shop system was also an unfair imposition on individual rights and was rightly abolished. It is again telling that the Labour party in government did not do much to roll back any of the Thatcher union reforms. They tacitly accepted that many of them were long overdue. It is another legacy of the Thatcher years that has stuck and changed the political centre of gravity probably permanently. She broke the glass ceiling. It's easy to forget that she was the first and so far only female Prime Minister. The joke that she was more masculine than many of her contemporaries and predecessors/successors obscures that fact. She showed that with skill and determination women can achieve the highest elected office in the land. She inspired successive generations of women across all political parties. For this alone she would have remained an important historical figure even without all the other reasons. I am sure I will return to this subject repeatedly in the future but for now RIP Margaret Thatcher. I've banged on about drugs policy enough times on this blog for most readers to know my view. But just in case you're new in summary our drugs laws are stupid. Very stupid. They do not take into account the evidence correctly and front line politicians, especially in the Home Office have time and again shown themselves to be wilfully blind to the harms their laws are causing. Whenever challenged they consistently come out with a statement which is some variation on "drugs are harmful which is why they are illegal" completely failing to engage with the debate and missing the point that most campaigners fully recognise they are harmful which is why we want the law to change to help reduce that harm! I do try to give the benefit of the doubt to those who disagree with me on this. It can be difficult sometimes though when the evidence seems to be deliberately ignored. "It hasn't started yet because the big problem is getting hold of the drug. Finding a company to provide a clinical-grade psilocybin had proved impossible as none is prepared to go through the regulatory hoops". "So we are between a rock and a hard place, which is very unfortunate, because if this is an effective treatment for patients then they're obviously being denied that possibility so one of the things we have to do now is have a more rational debate about the way the drugs laws are being implemented." "Our licensing regime enables legitimate research to take place while ensuring that harmful drugs don't get into the hands of criminals. We have no evidence to suggest that the current listing of psilocybin as a schedule one substance is a barrier to attracting funding for legitimate research." But we have one of the most respected psychopharmacologists in the country saying that there is precisely this problem. I can only assume that the reporter who got the quote was telling the spokesperson about the problem Nutt had encountered which elicited that response. I don't think I have ever seen a clearer example of the Home Office wilfully ignoring the evidence that is in front of them. 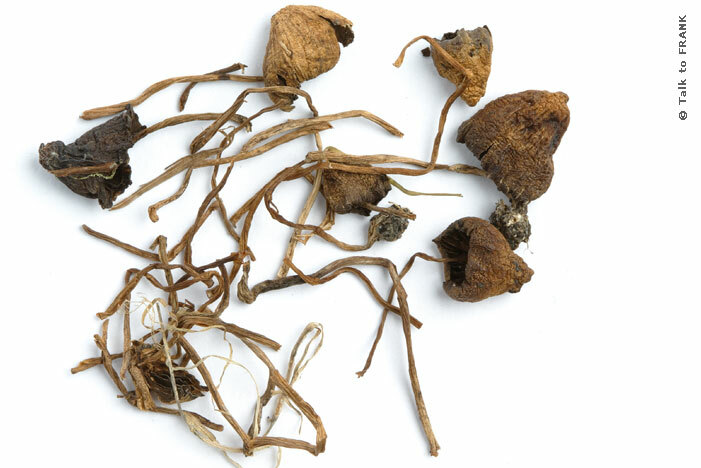 They are being told that there is a problem with the sourcing of psilocybin. In other words they are being given evidence that their policies are preventing legitimate research and their response is to say there is no evidence for that. Yes there is. Nutt just gave it to you. Until we can get around this kafkaesque culture of wilfully ignoring the evidence in the Home Office we are never going to get anywhere in trying to get a more sensible drug policy. We will of course never see a front page like the one above. That is because the Daily Mail has a very specific agenda. 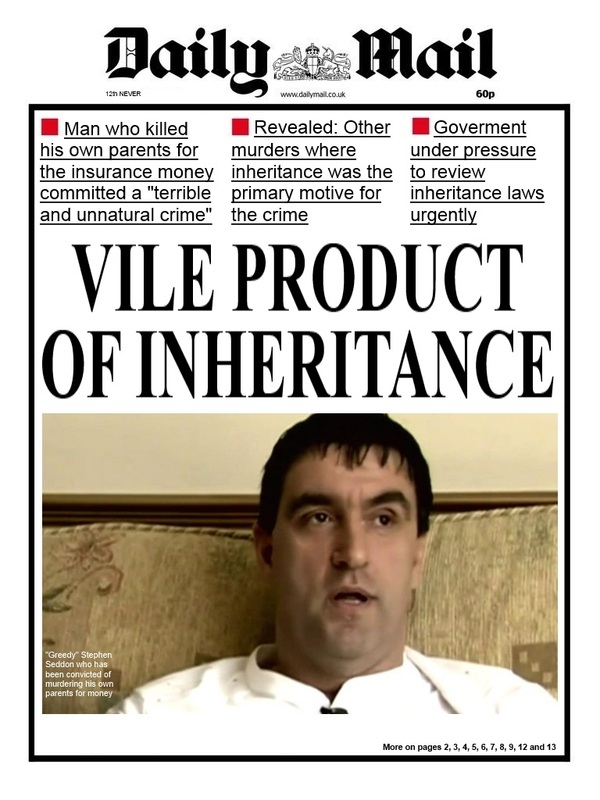 It has spent decades trying to demonise people on benefits and now that Mick Philpott has been convicted of killing his own children they see no problem at all in stating that Philpott and by implication his crimes are as a result of the welfare system. This is the very essence of confirmation bias. They don't like people who have lots of children on benefits. One of them is involved in a terrible crime. So they try to smear everyone on benefits by setting up Philpott as if he is somehow a representative of this section of society. He isn't. He is a horrible man who may well have committed similar crimes under any system. We now know that in his younger days he stabbed a former lover multiple times and nearly killed her. There is no suggestion that crime was motivated by our benefits systems. 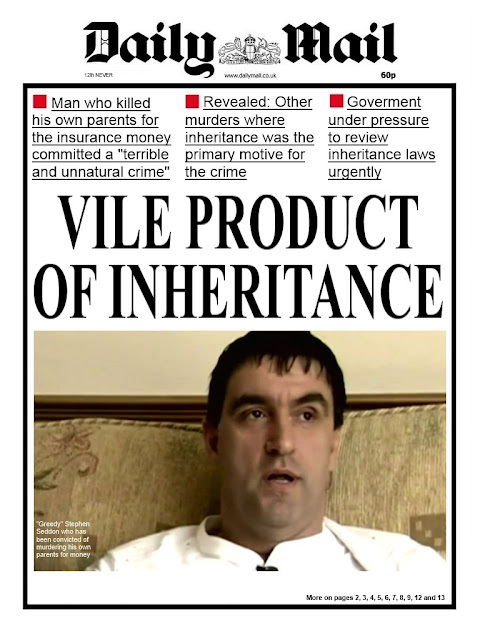 If the Mail were consistent in their campaign to try and reduce motivation for crime we would expect to see headlines like the one above and lobbying to increase inheritance tax or even abolish inheritance altogether. After all there have been numerous cases over the years where greedy offspring have wanted to get their hands on their parents' money early and have killed them in order to try and facilitate that. Surely the "solution" to this problem is to prevent this motive in the first place? It might seem a bit simplistic but that fact hasn't stopped them on welfare. The truth is that sometimes people commit dreadful crimes. Trying to link one-off cases like Philpott with something like the benefits system is frankly idiotic. So there are rumblings that the government is planning to freeze or perhaps even reduce the minimum wage for those over 21 years of age. This would be completely wrong-headed for at least three reasons. Most importantly it is simply not fair to penalise those who earn the least (which by definition are those earning the national minimum wage). They are the so called "strivers" that George Osborne keeps banging on about. Surely this government should want to protect them rather than see their real-terms salary fall? But if that's too wishy-washy namby-pamby sandal-eating muesli-wearing for you then here are a couple of economic reasons for you. If salaries are reduced then benefit claims will increase. The government will simply be shifting the burden from the private sector to the taxpayer and hence helping to further subsidise companies that should be paying their staff more not less. If anything this will make the deficit even worse. Also those earning the least are the most likely to spend what they get. This is exactly what you need to boost growth and hence the mooted policy is the exact opposite of what the country requires. I hope this is just bank-holiday flag flying. I also hope that Lib Dem ministers will have nothing to do with this mean-spirited and economically dubious nonsense.